John is a muti-talented entrepreneur - a jack of all trades - who became one of the first Instructors for Bird Man International in the USA in 1999. He is a Master parachute rigger and operates Storrie Parachute Works, Inc where you can have skydiving gear custom made-to-order! John is also into guns and competition shooting and is a licensed Class III machinegun dealer. He also runs the Vested Interest, making a variety of popular photo vests and equipment for the professional photographer. 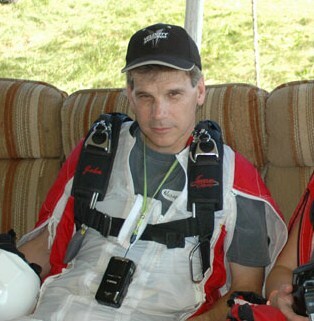 Residing in Denton near the Dallas-Ft. Worth area, John covers all of North Texas with his many services, wingsuit instruction among them.